Well hello there. Name's Max. A pal of mine said I should make a post in this forum for what I'm doing. I never contributed to a forum before so this might get a bit messy. Anyway, what's this post about? The answer is a Casing Making Engine. Now, some might think "But aren't there already quite a bunch of 'em?". And yes, yes there are. But the thing is...I don't like them, except aaonline.fr, which is great. Now I decided to make my own. It's still in development but I figured I might not develope it behind the curtains but open instead. Beta's in version 1.1 currently but will soon come to Beta v1.2 (Open Beta). Currently I'm looking for some more testers for the closed beta, so if you decided to take a look at it and are interested, you can contact me (contact details at the very end). But I'd also like to hear opinions on what's shown currently. Now, an overview of it can be found on the project page on my (VERY empty) website here (Note: Download is blocked for non testers during closed beta). You can view the demo videos of the engine there as well. I will post a demo video there after each major update, which will be announced here as well. Before I list up all current supported features, I'll explain how the engine actually works. 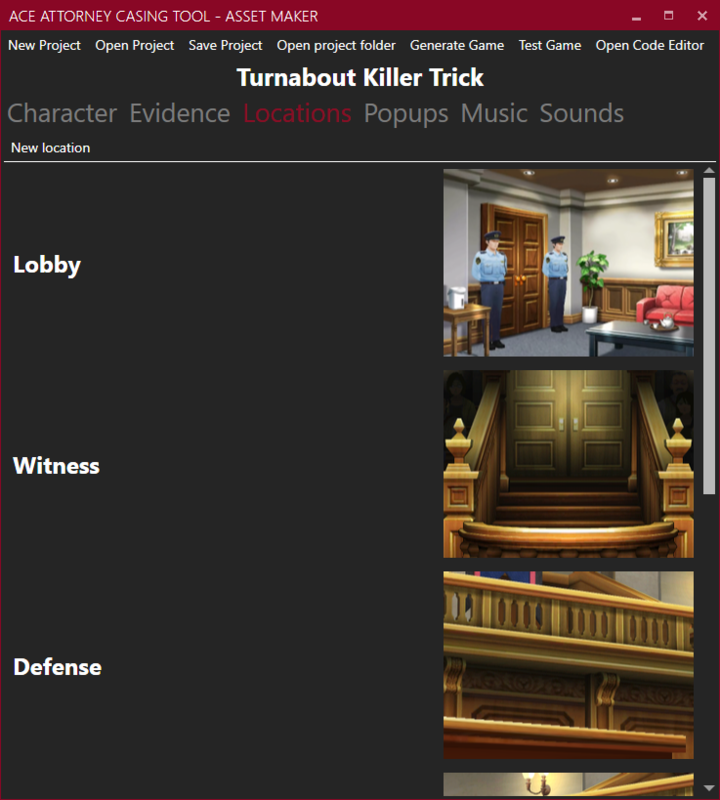 The Ace Attorney Casing Tool consists out of three parts, two of them for creation, one for playing. The Asset Maker is the tool you'll use to set up your projects by adding Music, Sounds and Images. It provides various editors to set up characters + animations and locations. 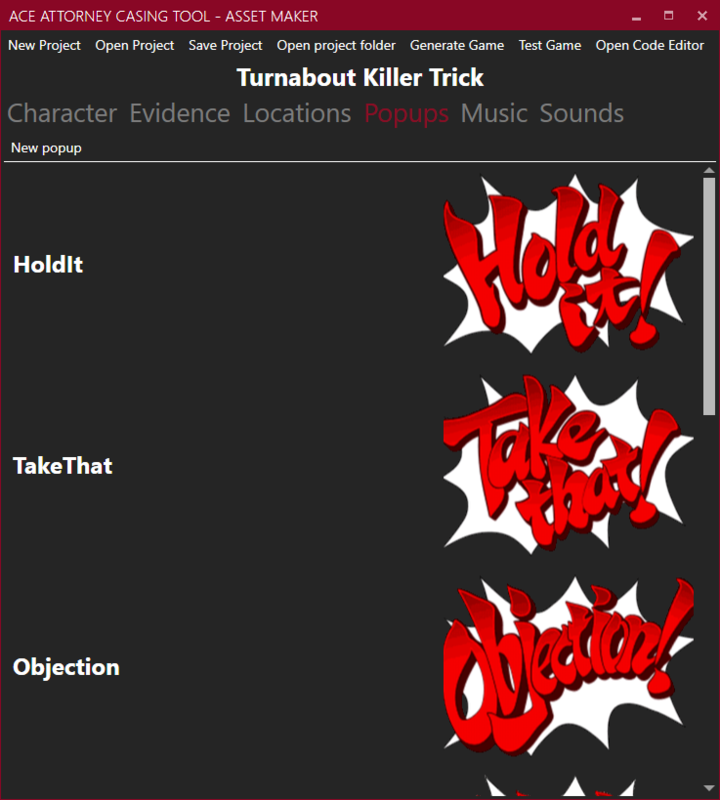 Here are some example screens, on how a project setup could look like. After the asset have been set up, you have to write the game's script. Wait? Script? But doesn't it say on the website "With this engine you can create smaller AA styled games without writing a single line of code"? Yes, but by that I mean real code. Programming is what I mean by that. 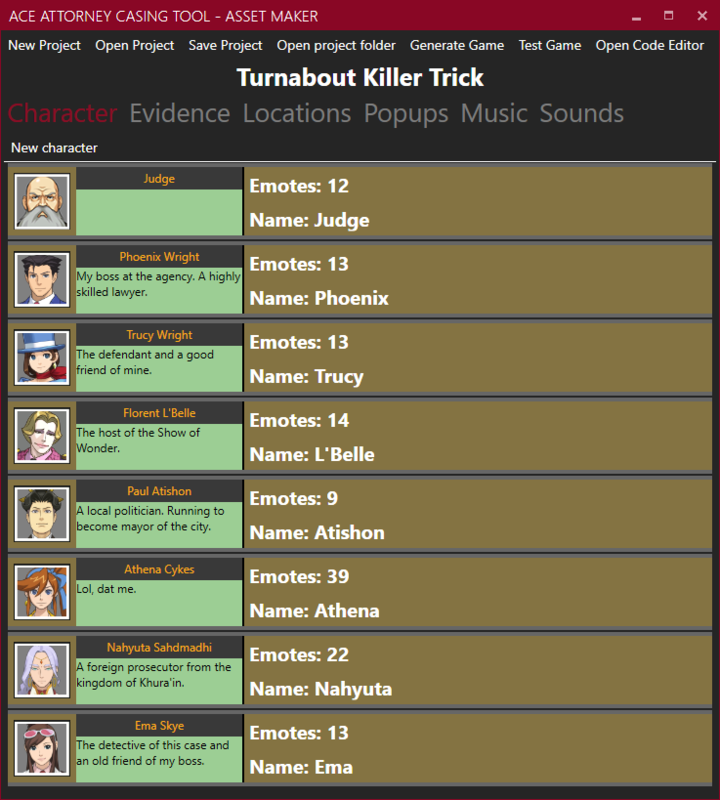 I've created a script "language" called Ace Attorney Casing Tool Script (AACS) or short ToolScript. It's not a complex language but rather just a bunch of instructions which tell the engine what to do next. 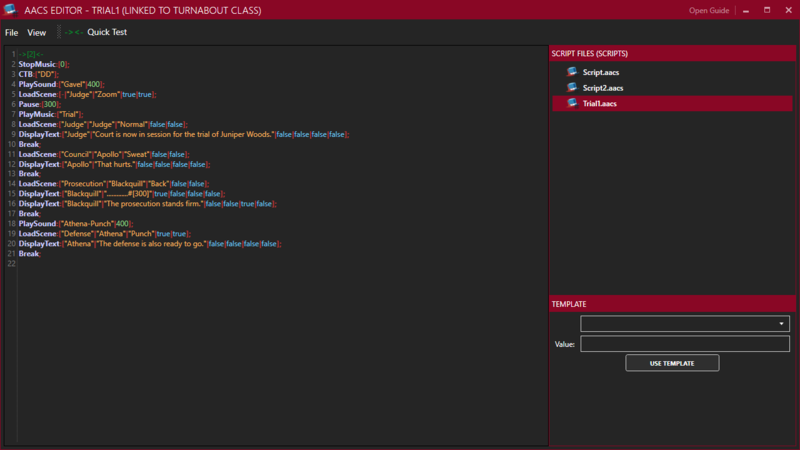 There's a code editor which should help a bit on writing the script. Well that's basically how you set it up. 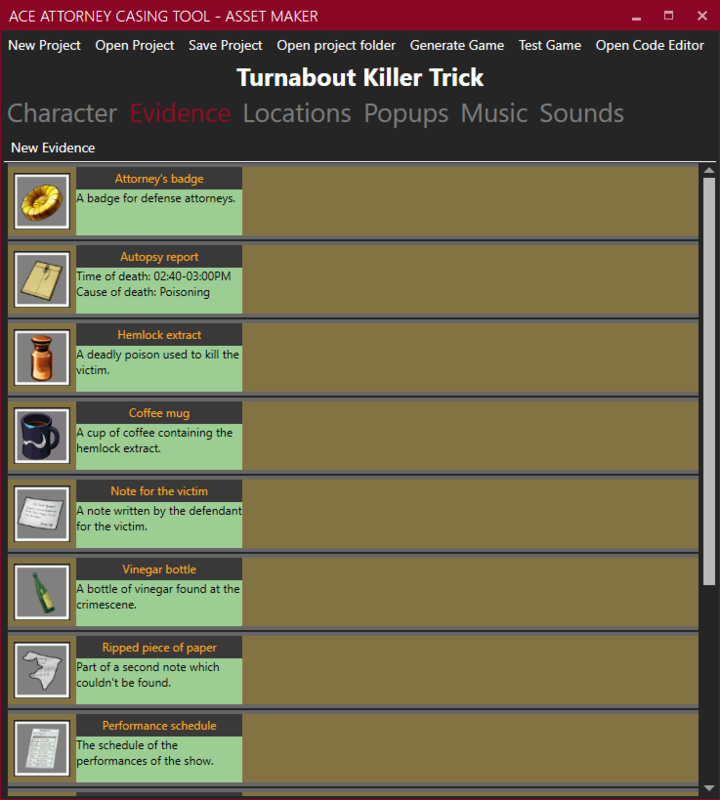 I show screens of the Case Engine, as it is shown in the tech demo on the website. Though I'll provide more details if asked, of course. But now to the list. I've also changed the way versions work. Version 1.x will refer to a beta version, including the open beta. I'm pushing the abbilities a bit to the back since I need graphical assets for them, which isn't my strength, so that might take a bit longer to implement. Also if you got any suggestions on features you'd think are nice, I'll consider them. And that's all right now. Once again, I'd love to hear some opinions about it. So if you decided to use this engine, please consider to join the discord server of the development. Last edited by MaxDeBy on Thu Apr 18, 2019 3:19 pm, edited 4 times in total. Well it's not really a DD or SOJ Case Maker. You can use whatever sprites you want. I just chose to use 3D Sprites, since I prefer them. But you can also use DGS Sprites or Trilogy Sprites. Whatever you want. The engine doesn't provide any presets or any assets at all. Ah, I see. But still, it's nice to see something where we can use the 3D stuff and have it look decent. Well I came back with the intention to post an update but uh...apparently I made a mistake with the version numbers. Anyway, uh, here the update: 80% of the work is almost done, but the biggest parts are still in development which means the update will still take a while. I really loved how your showcased the features in your videos. I hope it will be made available to the public soon. Yes, it will infact. I‘m working on the last couple of features I mentioned above. When they are finished, my current beta testers will test that version and after a week or so open beta will start, meaning everyone can access it for free. I will provide more details when the time comes. I've lost count of how many times I've done that lol. You got me really surprised when I checked my emails just ten minutes ago. And as I've said, it's good news and I can't wait to try it. Well it's been a while again. And again longer than expected. But here's an update. The update is finally finished. The update will be tested inside the closed beta for a week. Afterwards the engine enters open beta which means it is available for everyone to use. Well the release of the open beta is sadly delayed due to technical difficulties with the release pipeline. I am waiting for a response from the Microsoft support. I hope it‘ll be resolved until next week. Alright. Finally. The engine has reached the public open beta. 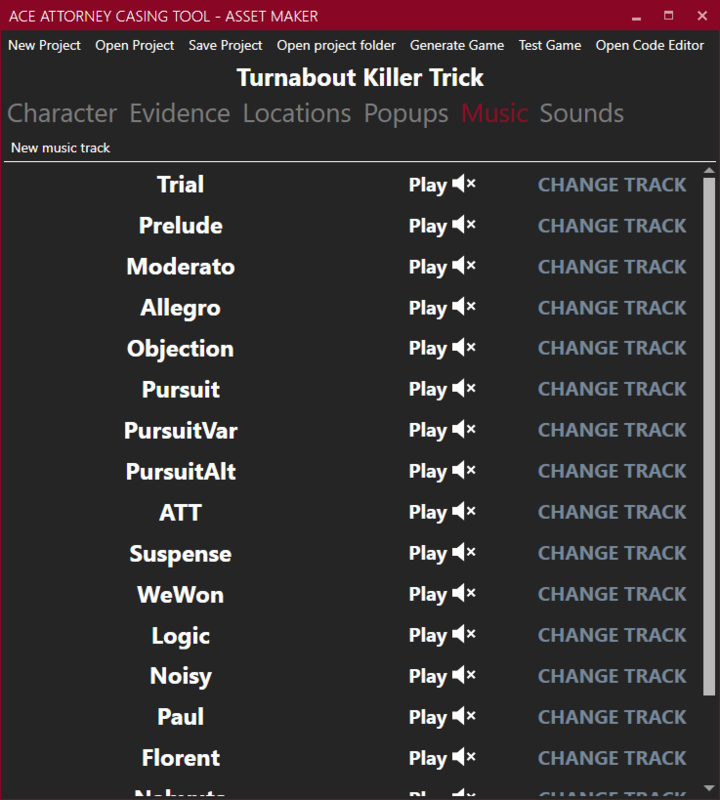 If you'd like to try it out, visit https://www.debygames.com/Home/Product?name=Ace%20Attorney%20Casing%20Tool to download it. And also join the discordserver if you want to submit suggestions or feedback to the engine. The link is on the same page. Thank you very much! I'll try this out for sure.